The Australian WWI War Animal Memorial, unveiled in Pozieres, France, last year. Beneath the sculpture is a stone of remembrance for the Australian Army Veterinary Corps who saved and cared for thousands of war animals. A War Animal Memorial is being unveiled at New Zealand’s National Army Museum in Waiouru next month, with the occasion honouring the horses, dogs, camels, pigeons and other animals who contributed to war efforts. The memorial owes its creation to the efforts of the Australian War Animal Memorial Organisation (AWAMO), which was set up to promote the establishment of memorials and plaques honouring the animals that served alongside NZ Defence Force and Australian soldiers during service abroad. 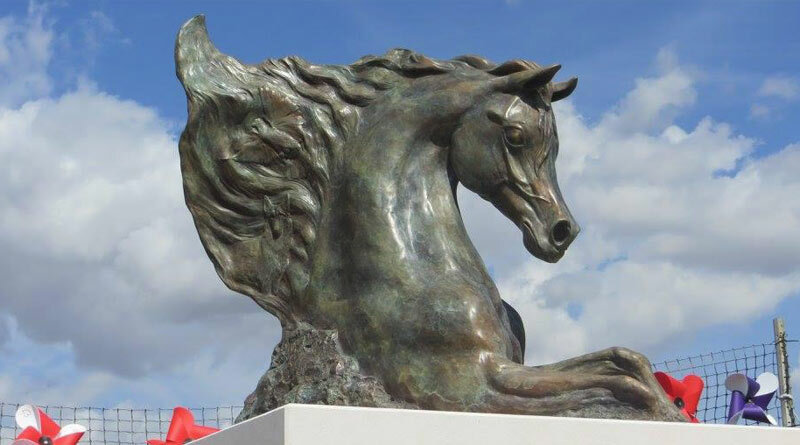 “Emerging Spirit”, which was unveiled in France last year. The wreaths are from Australian horse breed associations, schools, and VIPs from various nations. It will be unveiled at 10am at the National Army Museum, on Saturday, February 24. Animals from all sides worked alongside the troops as beasts of burden, as messengers, ambulance carriers and as comrades. Animals were used by all sides, often press-ganged into service; they had no malice and worked tirelessly no matter what nation they served. “These animals demonstrated true valour and an enduring partnership with humans, the bond was unbreakable, their sacrifice was great – we should honour these animals,” said Nigel Allsopp, AWAMO president and 2017 Australian Anzac of the Year. The AWAMO opened the first war animal memorial – titled “Emerging Spirit”, on the Western Front, at Pozieres in France, in July 2017. Beside it is the New Zealand war animal memorial. Both were created by internationally renowned artist Susan Bahary. “So often have the ANZAC fought alongside, AWAMO could not have imagined a war animal memorial without our close allies being represented,” said Allsopp, who designed the memorials. Pozieres was the scene of some of the most bitter and costly fighting for Australian troops in WWI. The battle was also the place of untold losses in animal life. It is estimated that over 9 million serving animals perished or were wounded in the Great War. The NZ War Animal Memorial in Pozieres, France. “We should never forget that not only two-legged but four-legged diggers served this nation and still continue to do so today. These animals have demonstrated true valour and an enduring partnership with humans and they will now be honoured with this beautiful new memorial and rose,” he said. Directly opposite this is the war animal memorial for all nations. War Animals are defined by the AWAMO as any animal used in aid or comfort of defence personnel. Military service is defined by the AWAMO as peace or war operations or employment. When the main body of the New Zealand Expeditionary Force sailed from New Zealand in October 1914, a quarter of its men (1940) and more than half of its horses (2032) belonged to the NZ Mounted Rifles Brigade. The brigade was arranged in three regiments (the Auckland, Wellington and Canterbury mounted rifles regiments, each of 549 men and 608 horses) with medical, engineering and support units. Each regiment contained three squadrons of 158 men and a machine gun section. Between 1914 and 1916 the New Zealand government acquired more than 10,000 horses to equip the New Zealand Expeditionary Force. In April 1916, more than 3000 animals were sent from Egypt to France with the New Zealand Division. Several thousand of the New Zealand forces’ horses remained in the Middle East. The NZ war horse was to play a major part in WW2 mainly as supply transport and as pack animals, and on the home front. In New Zealand the NZMR continued to operate troops of horsemen for training and also to mobilise a Home Guard to patrol the long New Zealand coast. The NZDF still maintains military working dogs and some Special Forces personnel use equines to carry equipment in difficult terrain in operational areas. The Australian WWI War Animal Memorial, in Pozieres, France.